The fifth grade students in my classroom recently learned how to plot points on a coordinate plane. They have been working on plotting both positive and negative plots. Originally as an enrichment activity, I found several coordinate graph pictures on an educational website for the students to complete. The class enjoyed this activity so much that I now have a tub full of graph paper for them to plot points and create! Every picture that is completed correctly is hung on my door. Currently, the front and back sides of my door are completely covered! I have included a slideshow to show just how talented my students are! I am almost three weeks into my experience at Meadows Elementary as an Intervention Teacher and I am proud to be a Meadowlark! I enjoy working with the wonderful students and the enthusiastic staff everyday. I have had the opportunity to volunteer during after school clubs and will be at the upcoming Vigo County School Corporation Literacy Fair on Saturday. Also, I have completed a classroom makeover and provided several interventionists, including myself, a fun and inviting place to work with small groups. This week was ISTEP+ assessments and I helped administer the test to a group of fifth grade students. The experiences and lessons that I have learned at Meadows Elementary so far have helped me become a better educator! As an Intervention Teacher, I work with small groups of students ranging from kindergarten through fifth grade. Mondays, Tuesdays, and Wednesdays are devoted to reading and writing activities while mathematics is the main focus on Thursdays and Fridays. 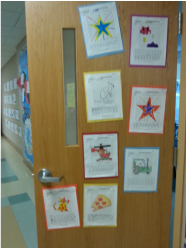 I am currently working with kindergarten students on beginning reading skills using the Wonders series. Also, I focus on counting and cardinality skills with the kindergarteners. For first grade, I plan lessons in parts of speech and telling time. I currently do not have a mathematics group for second grade students. Instead, I work with four students using the Read Naturally Live program to enhance their fluency and comprehension. Third grade students work with me on reading comprehension and computation problems. I will soon have a fourth and fifth grade group, but I have been pushing into the classrooms to teach writing while the head teachers meet with individual students to work through last year's ISTEP questions. As I mentioned earlier, I have decorated and organized a classroom to meet the needs of the intervention teachers at Meadows Elementary School. In the slideshow below, you will be able to view photographs of several bulletin boards and educational materials. There will be more to come after ISTEP week is over! 1. Pour about a cup of water in the large mixing bowl. 2. Then, pour the 16 oz. of cornstarch in the bowl with the water. 5. 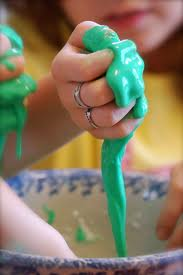 Add drops of food coloring to the oobleck until reaching a desired color. Again, this activity is so simple and inexpensive. Making oobleck would be a good introduction or conclusion to a series of lessons on matter. I highly recommend this project to any teacher, group leader, or parent! The science unit that I am currently teaching in a 4th grade classroom is titled Exploring the Oceans. The following link is a great interactive resource for students and teachers to use. Videos and facts are available for different animals or exploration equipment. I look forward to introducing the students to this website tomorrow during class! Visit my blog later this week to view my Oceans WebQuest, which the students will use in the computer lab. As many of you know, I have spent the past eight weeks at Dixie Bee Elementary School working with students with mild disabilities. I had the opportunity to help change the lives of children ranging from kindergarten through third grade. Today was my last day at Dixie Bee and the feelings were bittersweet. I am anxious to begin my second student teaching placement at Carolyn Wenz Elementary School, which is in my hometown of Paris. However, it was definitely hard to say goodbye to so many friends. I have been a part of 11 young lives for the past two months...and they have been a part of mine. We shared treats this morning and I presented them with a small gift before leaving. Even though we all knew this day was coming, it was still hard to part with the students. I was received many hugs throughout the day and even witnessed several tears. I reminded the students that I would also think of them and promised to visit in December. Not only was it hard to say goodbye to the students, but to my cooperating teacher as well. Mrs. Kraly was an outstanding role model to me as a prospective teacher. She allowed me to step out of my comfort zone to try new ideas and plans while offering support and help at all times. Mrs. Kraly shared her resource room with me for eight weeks, which is sometimes difficult for teachers. She quickly became more than a cooperating teacher, but a friend that I will stay in touch with for many years. We were able to share experiences and stories on both personal and professional levels. Before leaving Dixie Bee, Mrs. Kraly gave me a gift to use in my future classroom - a Flash Master! (If you are not familiar with this teaching tool, check out my Wish List for a description.) I am blessed to have had the opportunity to work with such a talented educator. The staff at Dixie Bee Elementary was also so welcoming and supportive. As a resource room teacher, Mrs. Kraly and I pushed into several classrooms during the day. These teachers were kind enough to share their resources with me for future use. I receive many emails with attachments of lesson plans, classroom posters, and ideas which is extremely helpful! Three teachers allowed me to do observations in their classrooms so that I could note different methods of teaching and get more ideas. I could not have asked for a better support system during my first placement!